Neem Oil For Psoriasis: Is Neem A Psoriasis Remedy? Is Neem A Psoriasis Remedy? Neem research shows that neem oil relieves the symptoms of psoriasis. Could there be a new cure for the skin disorder? Neem oil does not cure psoriasis. Nothing cures psoriasis. The skin disorder is a genetic condition, and we can't fix our genes (yet). Neem can, however, be a godsend for people suffering from psoriasis, and it can help control psoriasis symptoms. Neem treats psoriasis symptoms so successfully that some people claim to be cured. In reality they still carry the potential of a psoriasis flare up in them, but thanks to neem they can lead a symptom free life. There is a caveat. In some people neem has indeed worked miracles, but for others it hasn't done much. Why? Well, the truth is, there is a lot about psoriasis that isn't fully understood yet, and there is also a lot about neem and neem oil that we don't know yet. As a result nobody can tell you many specifics about the interactions of neem oil and psoriasis. What we do know about psoriasis and neem oil is outlined below, and should go some way towards explaining why neem oil is so beneficial for psoriasis. What Is Psoriasis? What Are The Causes And Symptoms? If you are a psoriasis sufferer you know all this, so I'll keep it short. Psoriasis is an inflammatory skin disorder. Psoriasis symptoms include redness, dryness, itching, and the tell tale thick, dry, silvery scales that appear as discrete patches on the skin. The patches can be anywhere on the body, but are most common on the trunk, the knees and elbows, skin folds, as well as the scalp and fingernails. The patches (and other symptoms) are a result of the skin in that area growing much too fast. The skin cells are renewed so often that the old cells have to shed in thick scales. Psoriasis symptoms can appear at any age, they can appear suddenly or gradually, and they are characterized by frequent remissions and recurrences (they forever come and go and come again). The root cause of psoriasis is genetic, but carrying the genes does not necessarily mean symptoms. It also takes an environmental trigger. Several factors can trigger or worsen psoriasis symptoms: skin infections (like boils), systemic infections (like respiratory infections, flu), stress (that's a big one), alcohol consumption (interestingly this triggers psoriasis only in males), medication. Any skin irritations or injuries, like infections, cuts, burns, rashes, insect bites etc, make symptoms worse. Anything that weakens the immune system makes symptoms worse, and in people with autoimmune disorders (e.g. rheumatoid arthritis) or immuno-suppressed people (e.g. transplant recipients, cancer sufferers undergoing chemo, HIV) psoriasis can be very severe. Symptoms improve with lots of sunlight, air and Vitamin D. Psoriasis symptoms often clear over summer, only to return again next winter. How Does Neem Oil Work For Psoriasis? One company that sells neem products is so confident in their neem psoriasis pack that they offer you a guarantee: you get your money back if your symptoms do not improve. How can they be so confident? Neem oil is a brilliant emollient, a substance that softens and moistens dry cracked skin. This straight away eliminates a lot of the irritation and itchiness. It moisturizes and protects and heals any lesions or scaling. Neem also soothes the redness and irritation directly, through the steroid like effect of some of its ingredients. Yes, neem can affect your skin similar to the way steroids do, but without the nasty side effects. Neem oil generally enhances skin health and the natural immunity of your skin, which is one of the biggest factors in psoriasis. Neem oil is strongly antibacterial, and the benefit of this for psoriasis is obvious. 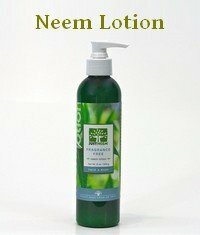 Neem cleans up any skin infections that may have developed because of cracked broken skin (due to dryness or scratching). 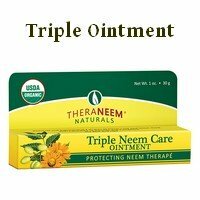 A neem ointment can fight the infection while at the same time reducing inflammation and soothing the skin. 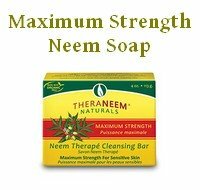 When used regularly (by using a neem soap, neem shampoo, or neem lotion) neem also prevents any future skin infections that may aggravate or bring back psoriasis symptoms. As a bonus neem oil also prevents insect bites, another trigger that can worse symptoms. DEET, the synthetic chemical in insect repellents is a known skin irritant which would aggravate psoriasis symptoms. 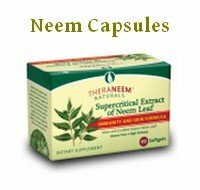 Neem leaf supports and stimulates the immune system. (Neem leaves are available as capsules, liquid extract, tablets, or as neem tea.) Anything that helps your immune system helps with psoriasis. One research study showed that when people who used the common coal tar treatment for psoriasis also took neem leaf extract internally, then their psoriasis symptoms cleared up faster. Other research reports showed that nimbidin, one of the components found in neem seed oil, has anti-inflammatory properties comparable to standard drugs like phenylbutazone (non-steroid) or prednisolone (a steroid). 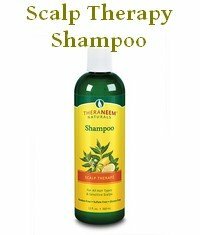 Experiments and reports from patients with psoriasis suggest that taking neem leaf orally combined with a topical neem oil treatment (like baths, soap, lotion or salve) can be at least as effective as coal tar and cortisone in treating psoriasis, with none of the nasty side effects. Neem Oil For Psoriasis: Why Doesn't It Work For Some? If you go back and read through everything that can trigger psoriasis symptoms you will find a few things that neem can't help you with. Neem can't eliminate stress from your life and neem doesn't stop you from drinking. If for example a male psoriasis sufferer covers his scalp with neem oil, washes it out, and then goes to the pub for a big night, do you think he'll see a miraculous remission of symptoms? Of course not. The same is true for people who are caught in a stressful phase of their lives, or people who naturally worry a lot. Poor diet, lack of sleep, there are many things that can weaken your immune system. Some people may have other reasons, totally beyond their control, that lead to a weakened immune system. Any of those factors may end up being stronger than the beneficial effect from neem on psoriasis. Neem is the best treatment for psoriasis symptoms that is currently available, but that does not mean it's guaranteed to work. You need to make the necessary lifestyle changes as well, and you need to give this time. Anybody looking for an easy overnight fix will just waste their money. You can't cure psoriasis, but you can often make it go away, by eliminating or minimizing everything that is known to cause flare ups or to aggravate symptoms. Neem oil goes a long way in helping you do that. You can find a selection of neem products recommended for psoriasis here. Phytother Res. 2004 May;18(5):419-24. Nimbidin suppresses functions of macrophages and neutrophils: relevance to its antiinflammatory mechanisms. Pandey SS, Jha AK, Kaur V. Aqueous extract of neem leaves in treatment of Psoriasis vulgaris. Indian J Dermatol Venereol Leprol [serial online] 1994 [cited 2007 Oct 6];60:63-67. Planta Med. 1981 Sep;43(9):59-63. Anti-arthritic and anti-inflammatory actions of nimbidin. Rajasekharan, S.; Pillai, N.G.K.P; Kurup, B.P. ; Pillai, K.G.B. ; Nair, C.P.R. (1980) Effects of nimbidin in psoriasis - a case report. Journal of Res. Ayurveda. 52 - 58. David, S.N. (1978) Effect of neem oil and its constituents on cotton pellet inflammation. Mediscope. 20: 273-274.